Deepak Chopra is at it again. Yet in the process the colobus has bad indigestion — as the narrator intones, "They don't seem to like their diet very much." And indeed, the monkeys on camera look listless and sour-faced. 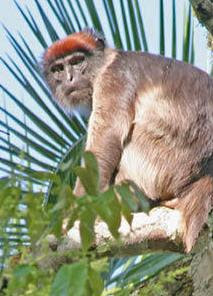 But the red colobus recently made a life-altering discovery. They found that if they eat a bit of charcoal from the abandoned fires of local villagers, their indigestion is cured. This had made them happier monkeys, and as a result their numbers have dramatically increased; not only that, but they are free to explore other food sources. These advantages aren't felt by the white-and-black colobus, who haven't hit upon the charcoal-eating trick. New generations of red colobus learn the habit by having it passed on from mother to child. It's amazing how much critical knowledge is contained in this one anecdote. Self-medication is well known, but here the red colobus has hit upon the same property in charcoal that emergency room doctors use when a patient arrives with acute poisoning. Medical science is able to explain how charcoal absorbs toxins in the stomach. Monkeys can't explain anything or do laboratory research. It is completely untenable to claim that they eat substances at random until they hit upon just the one perfect remedy — such random behavior isn't seen among them. Nor is the behavior genetic, because native tribes moved into the vicinity of the colobus and lit fires only recently compared to the 40 million years that monkeys have existed. What we are witnessing is an intelligent discovery on the part of creatures who stand far below Homo sapiens on the evolutionary chain, and that discovery is being passed on from mother to child without genetic adaptation. To me, this means that quite a blow has been struck for intelligence being innate in the universe. It suggests that evolution itself has never been random but is guided by the principle of intelligence — not "intelligent design," which is a red herring supplied by religious conservatives. The intelligent universe is a cutting-edge idea, not a throwback to scripture. As a theory, it gives us a much more elegant explanation for many things that are clumsily explained by falling back on randomness to explain every new development in Nature. At the moment, evolutionary theory refuses to abandon the notion of random selection, and geneticists cling stubbornly to the doctrine of random mutations to explain why new things appear in the unfolding story of life. We all have a stake in this argument, however. Seeing the red colobus evolve before our eyes cannot be denied. It didn't happen randomly, and their new discovery represents a quantum leap forward in their survival. There's much to think about here, since we want to know how early humans made their first discoveries and passed them on to us. Rather than saying that a larger brain made intelligence possible, why not say the opposite, that intelligence dictated a larger brain so that it could expand? Life moves forward inexorably, no one doubts that. Now it's up to us to explain the hidden forces behind evolution, in hopes that we can tap those forces and guide our own future. The main problem here, of course, is the notion of the "Great Chain of Being." Since monkeys cannot "do laboratory research," therefore they are too dumb to make a discovery. One wonders how Chopra thinks "folk medicine" arose ... oh, never mind, he'd explain it the same way. No doubt he'd also explain how the bacteria "learned" to neutralize cyanide and how the monkeys "learned" how to get the bacteria in their guts the same way. But it is amusing to contemplate how Chopra thinks he knows enough about colobus monkeys from one episode of the PBS program, Nature, to be able to proclaim that "random behavior isn't seen among them," without which his musings are revealed as mere babble. Not to mention just how he explains why the Universal Mind doesn't like the white-and-black colobus monkeys. Hmmm. I thought the main problem in the piece was "Life moves forward inexorably, no one doubts that." a falsehood buttressed with a lie. But, of course, any piece of such length from Chopra is a target-rich environment for those looking to point out daft ideas so that there's something for everyone! Oh, and I quite liked "random selection" for packing so much ignorance about evolution into so few words. I thought the main problem in the piece was "Life moves forward inexorably, no one doubts that." But that is the "Great Chain of Being." I don't think so. The GCB is inherently static, setting out a hierarchical ranking of all living things (and non-living, IIRC). In such a hierarchy, life can't 'move forward inexorably' or otherwise. Chopra is going with a progressivist form of evolution (swapping out natural selection, random genetic drift et al. for various bits of woo). I can't be bothered to work ouw whether he's talking about a Teilhard de Chardin sort of thing with the highest forms (us) rising ever higher or the sort where all life forms strive to improve (the kind of thinking that drives 'So why are there still monkeys?'). Yes, he's closer to Lamarck's version of the Chain, with life being on a sort of escalator but he asserts that monkeys are "below" us and all life is progressing, so they will stay there. Living organisms are static relative to each other because they are all "progressing" under the Universal Mind's plan. I will be impressed with Chopra's argument after I see a rock eating charcoal. Wait a minute! ... doesn't that describe Chopra?